Wooden or composite decking can be a wonderful asset to your garden. But like any other construction or major improvement, it needs to be carefully planned and implemented to a high standard. There's no point installing a deck that dominates your garden when you really wanted somewhere to sit and admire the lawn and flowers! Similarly the decking you planned for the children to play out of the mud might turn out to be useless if it's far too small. So let's get it right from the start and build decking that will suit your requirements, enhance your property, add value to your home and be something you just love! The deck building experts at Horsham Decks and Patios are always happy to discuss your plans and offer advice. Call us now for a free quote. Having worked out a plan and decided on the best size and layout of your decking, the next decision is about the materials you use. 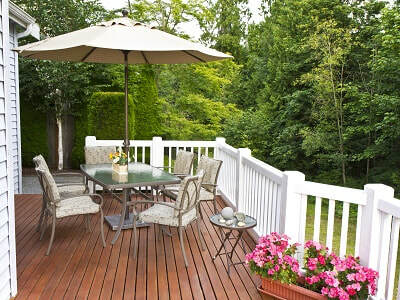 Will you opt for a practical composite deck or do you prefer the beauty and feel of natural wood? And if you choose wood, what type? Here we outline some of the differences and benefits of each type. There's no doubt that some people just prefer natural wood. But be aware that it will require more maintenance as it weathers over the years and the colour may change over time unless stains are used. There is a choice to be made between hardwood decking and softwood decking. There's quite a difference in price but hard timber will generally last longer and needs less maintenance. 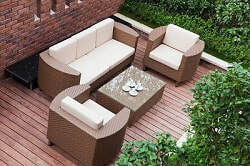 A softwood timber decking made of something like pine is cheaper to install but will require more frequent maintenance. Cedar is a long-lasting softwood and can be a good choice. Composite decking is made from a mixture of wood fibres and other materials, chiefly recycled plastics. It's often chosen because it's virtually maintenance free and the appearance of a composite deck can be stunning. The material enables you to choose colours that may not be practical with wood and they won't fade over time or need painting. Or you can opt for a composite that closely resembles timber and will need close examination before the average person notices! Whichever type of deck you choose, we'll build it with care and we have no doubt that you'll be delighted with the results.